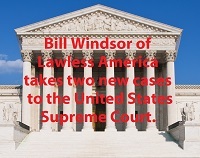 Bill Windsor of Lawless America has taken two new cases to the U.S. Supreme Court. Four cases were unsuccessfully taken to the Supreme Court by Bill Windsor in 2010. He's back with two new cases. 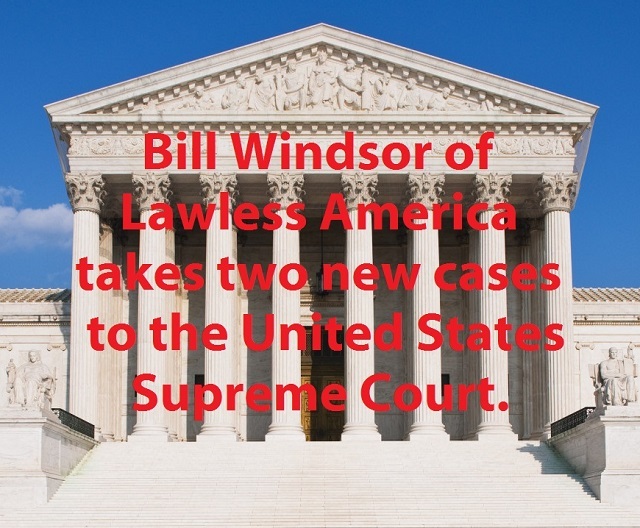 In 2010, William M. Windsor took his first cases to the United States Supreme Court. The issues were whether federal judges in Georgia were obligated to abide by the United States Constitution. Bill Windsor obtained extensive Internet publicity when the justices of the U.S. Supreme Court REFUSED to tell the federal judges in Georgia that they had to abide by the Constitution. That morphed into Lawless America...The Movie. Now Bill Windsor has presented the U.S. Supreme Court with two cases. Can the Idaho Supreme Court deny Bill Windsor's appeal of his unlawful incarceration in Ada County Idaho by claiming he appealed to the wrong court? It's a totally outrageous order designed to provide some insulation for the State of Idaho in a multi-million dollar civil rights lawsuit. Bill Windsor was legally raped by Ada County Idaho, and Bill's legal actions nailed the County and the State. Since the Idaho Supreme Court had no legal basis to deny Bill Windsor's appeal, they claimed he appealed to the wrong court. The Supreme Court said he had to appeal to the District Court. Just one problem -- the district court issued the order that he was appealing. The Idaho Rules of Appellate Procedure state absolutely clearly that the appeal goes to the state's ONLY appellate court -- the Idaho Supreme Court. There's not a chance in Hell that the U.S. Supreme Court will address this travesty of justice because it simply isn't a legal issue worth addressing -- it's just a fraud. The other case does stand a snowball's chance in Hell of being addressed by the U.S. Supreme Court. (If only judicial enemy #1 (Bill Windsor) was not the one bringing the issue). The issue is whether a lawsuit can be filed against an Internet screen name. A federal court denied William M. Windsor the right to sue in a court and seek redress of grievances from a gang of nameless, faceless criminals who live under rocks online. The right to petition for redress of grievances is as fundamental as rights get. The South Dakota Constitution, Article 6 Section 20 provides: “All courts shall be open, and every man for an injury done him in his property, person or reputation, shall have remedy by due course of law, and right and justice, administered without denial or delay.” William M. Windsor is being denied this fundamental right. Meaningful access to the courts is a Constitutional right. William M. Windsor’s Constitutional rights to due process have been violated by one sentence claiming the lawsuit was Frivolous because the defendants all had funny-sounding screen names like Ginger Snap. There was no basis to deny William M. Windsor’s causes of action based on the screen names of the Defendants. Perhaps the justices of the federal courts are unfamiliar with this newfangled thing called “the Internet.” On it, people commit crimes by the millions using fake screen names. There is no law to protect people’s criminal activity because they use a fake name. South Dakota and the United States District Court for South Dakota recognize Doe defendants. South Dakota law specifically provides for suing when a plaintiff is ignorant of the names of the defendants. SDCL 15-6-9(h) provides it. Although designation of a “John Doe” defendant is not favored in the federal courts, it is permissible when the identity of the alleged defendant is not known at the time the complaint is filed and plaintiff could identify defendant through discovery. So, the U.S. Supreme Court might take up this appeal. Let them tell our fellow Americans whether they can get away with any crime online as long as they use a screen name ... or serve warning that we all have the rights to sue the Ginger Snap's, Buttwholes, Petunia Snodgrasses, and TinyFeetNHands of the world.